In many industries, it's important for items to be easily transportable and effectively stored. From the oil and mining industries to the agricultural business, it's often necessary to move large amounts of stored items because of issues like seasonal or permanent changes. However, most storage solutions are not very portable, potentially requiring site managers to create semi-permanent storage spaces at numerous locations. Conex boxes make very useful portable storage containers for a wide variety of items. Repurposed shipping containers were originally used for trans-ocean transport, meaning that they are designed to fit traditional trailers and transport equipment. 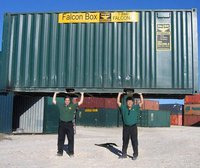 Storage containers can be delivered, removed, or relocated to even the most remote locations with ease. In addition to being mobile, portable shipping containers can be quite easy for you to access (while still protecting against potential intruders). If you frequently move large equipment in and out of the storage container, for example, you can add a large roll-up door to make access easier. Moving Conex boxes from location to location is often friendly to both your budget and the environment. You save manpower because you're not constructing a new building at each location, and you're not packing up items into a truck to move them. In addition, steel shipping containers can be recycled for many new uses, making portable buildings an eco-friendly storage solution. Finally, using portable storage can help keep your business organized. If you have complex inventories of what's in your storage, you won't be continually taking apart your organized items and then attempting to reassemble them at the new storage site. All you need to set them up is level ground. They block out wind and sunlight (ideal for dry goods storage). They keep out any water. They can be equipped with climate control if your items are sensitive to heat or extreme cold. Thinking about using modified shipping containers for your business?